Thank you for putting so much care and thought into our wedding. From our first meeting, it was clear to us that you wanted to make our wedding special. We have the deepest gratitude that you were a part of our wedding day. The moment we met Katie, we absolutely fell in love with her sweet demeanor and fun attitude. She made the entire process so great, so relaxing, and so enjoyable. 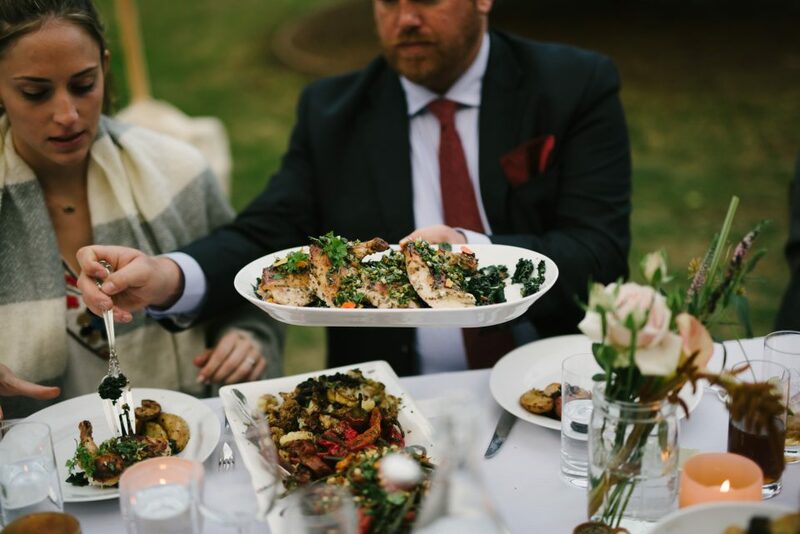 Friends and family told us that it was the best wedding food they had ever tasted, and some even said it was the best food they had ever eaten! Can we have the recipe for the squash blossom cappellini?!?! So many of our guests have commented on the amazing food and great service Katie Powers Catering provided! One of our friends commented that it was the best food she’s ever had at a wedding… and she’s been to a lot of weddings! Brandon and I are so proud of what was served on our most special day! Everyone raved about the food. The service was flawless! Thanks for making a wonderful experience for our friends and family. We loved working with you to create a custom menu. Everything was delicious! Thank you so much for creating an unforgettable meal! We feel so fortunate that you guys catered our wedding. The food was definitely a highlight! Our guests were raving about the food all night, and people are still commenting on how great the food was to this day. You all were professional and are wonderfully talented people.